For starters, I don’t dislike the Patriots (that much) and I’m definitely not a Giants fan. I just couldn’t find much reason to root for anyone. Then Tommy wrote about why Brady is better than Eli while only citing one football-related fact: Brady has won 3 Super Bowls. Given my contrarian nature, it was enough reason for me to root for Eli. Here’s several reasons that you can choose from in order to root for Eli over Brady. 1. Eli is guarding Joe Montana’s legacy – I grew up in a world where Joe Montana was considered the greatest quarterback in NFL history. Recently, while watching PTI, I heard Michael Wilbon utter the phrase “possibly the greatest quarterback ever” when he was talking about Brady. What? No way! This can’t be. There’s a million reasons why Montana is tougher, cooler, and flat-out better than Brady, but the big number is 4. The number of Super Bowls is the first and most important stat people will look at. I’ll simply refuse to entertain the Montana vs. Brady discussion until that Super Bowl number is equal. When/if that day comes, I’ll fight like the devil for Montana, but I’d really love it if Eli could save me the time. 2. Eli is guarding Peyton’s legacy – In the modern day, the argument has always been Peyton vs. Brady. I’ve always been a Peyton believer. To my eyes, it was obvious that he was better. And as this season got underway with Peyton on the pine and the Colts getting beat like Mad Dog Grimes, you could see the difference that a Peyton Manning made to his team. In a phrase, Brady makes his team better, but Peyton makes his team. (I put purposefully ignored punctuation rules and put that period in front of the parenthetical phrase so you could really feel the impact of that statement) For those of you that want to justify the Patriots going 11-5 when Brady was out by saying that Matt Cassel is pretty good, that argument has to be finished. You’ve had plenty of time to see that Cassel can’t turn an average team into an 11-5 team. This piece of argumentative leverage is the only good thing Cassel’s given me in his time with the Chiefs (that and a few days of pride when he was in the MFCEO commercial). Frankly, stats only make this argument tougher. I could always see that Peyton was more complete than Brady. But if Brady has four rings, the raw numbers will make him historically better under an avalanche of numbers (for people that think I’m contradicting my argument about Montana, I’m not. Both Montana and Peyton are better than Brady. You can have the Peyton conversation with me. I won’t allow you to bring up Montana). How will I explain to my kids that Brady was never more than a…what’s that? The Internet? They’ll be able to see everything forever? I’d better watch what I type here…Eli, just do your brother a solid. If this wretched season for Peyton ends with a Pats win, he doesn’t deserve to have his superior game buried under the weight of statistics. 3. Eli is defending the honor of Indianapolis – Possibly the worst season in Colts history ended by hosting the victory of their hated enemy the Patriots? Is there a single person in the host city rooting for New England? I know some Hoosiers, and I’d bet my Kansas state pride that they’re standing behind Eli to a man (women have this thing about Brady…It’s probably his ridiculous good looks). 4. 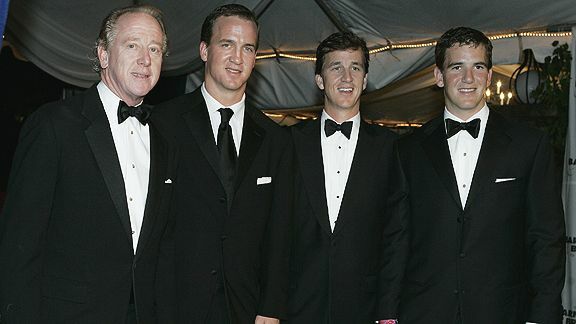 Eli looks like a regular person – Can’t overstate this. It matters, and other things equal, it would automatically make Eli the manlier choice. It’s like this: I want my quarterback pretty enough to sell Wranglers. I don’t want him pretty enough to sell Ugg’s (those pics were unfair…but this pic completely ruins my point) and walk jawline first away from explosions in slow motion. How can I relate to this guy? The apex of my personal beauty was when I was pretty enough to convince the girl working the register at Pizza Street to drop 29 cents off the bill to make my buffet an even three dollars (That’s right, pizza girl, I’m real cheap. You like that?). If I was Tom’s PR man, I’d have him doing some national spots for Miller High Life where he slips away from Giselle’s fancy, champagne-soaked dinner party to sit by his dog, fart and shotgun a High Life; then he composes himself and goes back into the dinner party..Tagline: Live the High Life. No Matter What…..Until this happens, I’m convinced that Tom can’t be the guy I’d root for. Eli? C’mon. He still looks like he could be QB1 on for the Dillon Panthers. 5. 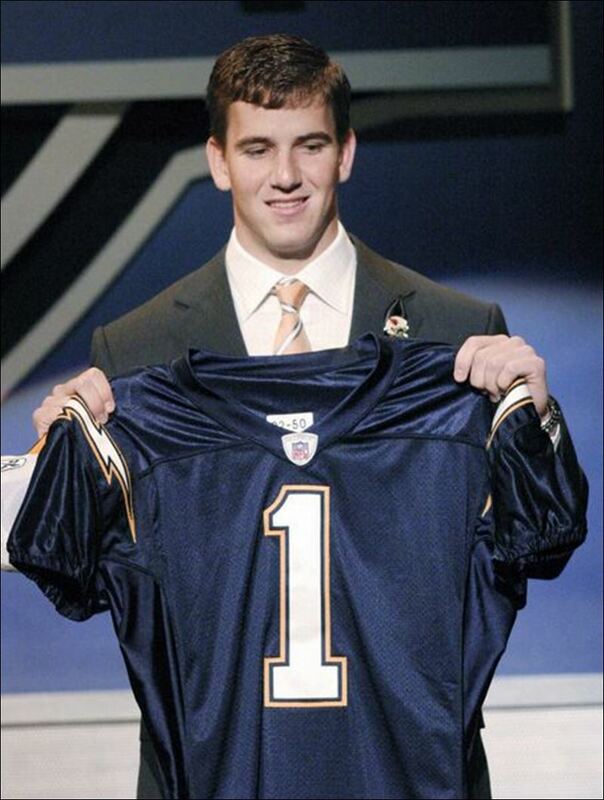 Unlike Brady, Eli made his own luck – There was a time when people disliked Eli for forcing that trade from San Diego to New York. Then people started saying that Phillip Rivers was (still is?) better than Eli. But here Eli’s going into a second Super Bowl. He decided to go there, and he made it happen despite shouldering the pressure of the least forgiving city in America. Brady? He simply accepted the only team that took him, then sat behind Drew Bledsoe with his fingers crossed that Bledsoe would get injured or play badly. Credit to Tom for taking advantage of the situation, but has anyone ever caught as many breaks as this guy? And if you even think about saying Eli did by being born into QB royalty, then you bite your tongue (because the validity of your argument would force me to erase too much typing). Just remember this: it’s harder to live up to high expectations than surpass non-existent ones. I’ll level with you guys. I originally planned on going for ten reasons, but it’s 9:30pm, and I’ve been typing for over an hour. I’m going to bed and praying that a Miller executive calls me with an offer for my ad idea (there’s a whole litany of “rich guys kickin’ back like all of us do” ideas here. US Weekly already proved that the “they’re just like us” angle has a strong draw…which, uh, I know about because I hear girls talking about it). Mr. Dustin “not Dusty” Riedesel Sr.